Accommodation facilities to impress the most discerning of guests, the 206 guestrooms and suites – Superior, Deluxe, Corner Deluxe, Junior Suite, Executive Suite, Mandalar Suite, and garden Spa Villas provides you a “taste of paradise” in itself. From each room one can experience some spectacular views of Mandalay Hill, the Royal Palace, the famous Irrawaddy River and the city of Mandalay, once the Royal Capital of Myanmar. The Executive Floor one can enjoy the exclusive use of a Private Lounge..
Add: 26th Street, Between 82nd and 83rd Street. We welcome you to our Mandalay City Hotel. It located at the heart of the city! Mandalay City Hotel is often called “Oasis” and one of the most famous hotel when it comes to value. It comes with varieties of services and facilities, exclusive access to swimming pool. It also comes with a exclusive access to business room, and its facilities and even more. The landscape and pathway, they are uniquely design to feel like you are at the Oasis. Last but not least, it comes 4 different rooms and all of them have its unique style..
Add: Strand Road, Between 22nd & 23rd Street, Thirimarlar West, Aung Myay Thar Zan Township, Mandalay, Myanmar. Opened in 2011, Ayarwaddy River View Hotel is just 15 minutes to Mandalay center, flower market, 60 minutes from the airport. Ideally located in the prime touristic area of Northern Mandalay, the hotel is in an easy access to the city's myriad attractions and landmarks, such as Mayan Chan Jetty, Thiri Mandala Bus Station (for Monywa, Shwebo), Chanthaya Paya. Looks out over the Ayarwaddy River, this is a pleasant place to explore in the early evening as the boats return to dock for the night. Ayarwaddy River View Hotel is overlooking the Ayarwaddy River so our guests will have a great river view in the hotel room as well as watch the sunset in our Sky bar at the roof top of the hotel. Ayarwaddy River View Hotel has 56 well-sized with pleasant wooden furnishings. Front- facing rooms look across the river towards distant Mingun, rear-upper ones overlook the city, Mandalay Hill and the Shan uplands. The pleasant roof top restaurant leads out onto the large ‘Sky Bar’ roof terrace & bar with fantastic views across the river to Mingun, and also over the city and onto Mandalay Hill. Guestrooms feature air conditioning, daily newspaper, kettle, mini bar, television, inhouse movies, seating area, shower, bathtub. Room rate is very reasonable when compare with other hotel in Mandalay. Ayarwaddy River View Hotel is an ideal place of stay for travelers to discover the sightseeing, religious interests, culture district of Mandalay. It's a pleasure for us to welcome you to stay at Ayarwaddy River View Hotel for a comfortable, relax vacation. 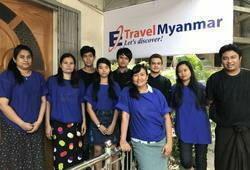 Add: Blk-732, No (44), Corner of 73rd And 28th Roads, ChanAyeTharZan Tsp, Mandalay, Myanmar. A short step away from the famous moated walls of the last kingdom of Myanmar, the hotel is placed at a highly convenient spot within easy reach of major sights – tourist attractions, old-style street markets, teashops, modern shopping malls and all..
Oway Grand hotel radiate an opalescent charm of contemporary Myanmar décor perfectly blended with the traditional warmth of Myanmar hospitality. Comfort and Convenience are the hallmarks of Oway Grand Hotel. Oway Grand hotel radiate an opalescent charm of contemporary Myanmar décor perfectly blended with the traditional warmth of Myanmar hospitality. Comfort and Convenience are the hallmarks of Oway Grand Hotel..